I’ve been lucky enough to be allowed to test the Omlet Eglu Go. 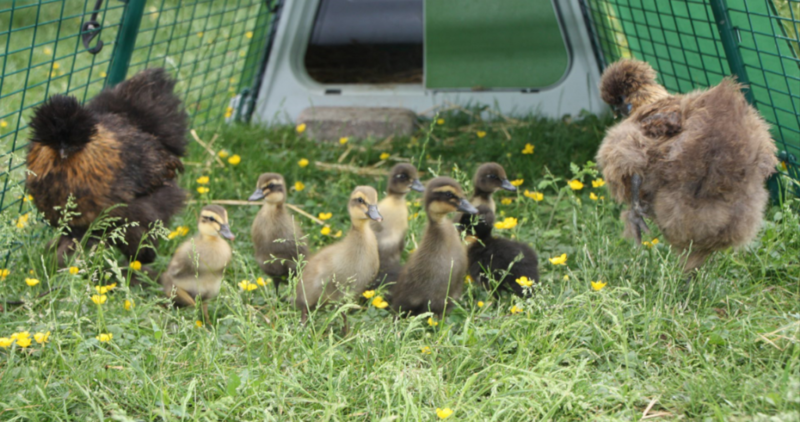 Over the spring and summer I’ve first had a brood of chicks and later a brood of ducklings living in my Eglu Go. The house is awesome to use as a broody coop and for raising chicks. 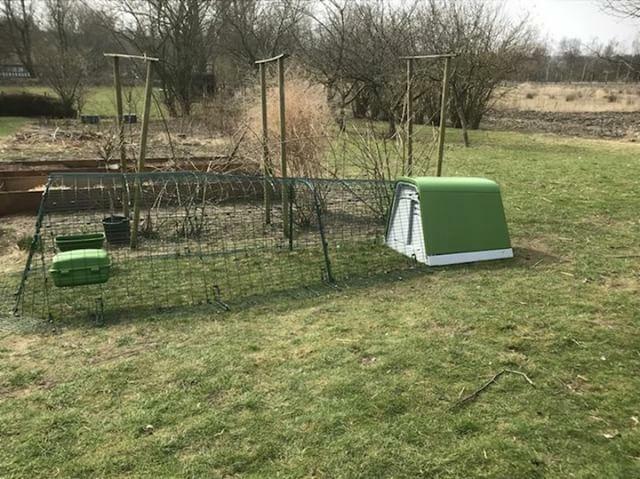 The house is easy to clean, has good draught-free ventilation, it has a good size for chicks and ducklings, and the attached run gives great protection for the little ones early on, when they are very exposed in relation to birds of prey and other unwelcome guests. At first, my chicks were living in a cage in our guest room. 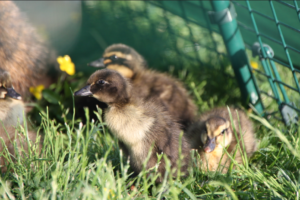 They were hatched using an incubator and needed a chick brooder in the first few months as it was very cold outside. When the temperatures started to rise and the chicks had more well developed feathers, I moved them out into the coop. I kept them here for about 10 weeks. There were 10 chicks and they fitted easily in the coop until they were large enough to move into the large chicken coop with the grown-ups. I removed the roosting bars in the coop since small chicks don’t sleep on roosting bars in the beginning. I filled the coop with a generous layer of wood shavings and straw since it was still cold in the spring. The coop is pretty easy to move around, especially if you add the wheels. 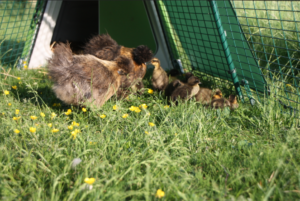 You can therefore move the coop and run when the grass starts to get dull, this way, the chicks always have fresh grass to walk around on. It’s great to have a closed run for the first while. Small chicks are exposed to birds of prey – this run keeps the birds from attacking. My grown hens were also a danger to the chicks in the beginning. Chickens aren’t always hospitable when it comes to new members of the flock. The small chicks could be left in peace in their run and the big hens could slowly get used to their presence. This made it so much easier to introduce them later, since they were already used to each other. When the chicks were too large to all live in the coop, I introduced them to the large flock, and then I suddenly had an empty Eglu Go. My ducks had laid a lot of eggs in a large nest but none of them were interesting in brooding. I already had two broody silkies, so I tried putting the duck eggs under them. The chickens weren’t discriminative about the eggs, and they happily lay brooding.. About a week before the eggs were supposed to start hatching, I moved the two hens and their eggs into the empty Eglu Go. The hens were very good about it and continued their persistent brooding, a week later 8 large ducklings came into the world. Again, I had removed the roosting bars from the coop since ducks don’t sleep on roosting bars. This way, there was also room for two nests. The hens got along fine and they didn’t seem to mind that their babies had webbed feet rather than chicken feet. 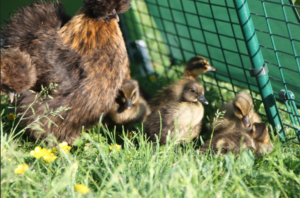 Again, the other poultry in the garden could slowly get used to the new arrivals, and for that reason, there were also no issues when, a few weeks later, I let the ducklings and their mothers out to join the others in the garden. 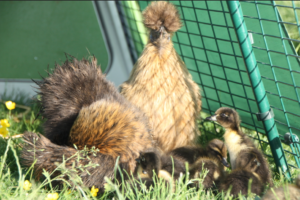 The benefit of having ducks in an Eglu Go is that ducks often prefer to sleep outside. At night I let them into the run attached to the Eglu Go and close the run door so they are protected from predators. At the same time, they can decide for themselves whether to sleep in the coop or out in the run. In the morning I open the run door, so they can run freely in the garden and collect slugs, snails and insects. I can definitely recommend this coop both for chicks and ducklings, whether hatched naturally or in an incubator. It’s a good idea to choose the 3 meter run, since it gives the little ones more space to play and explore.